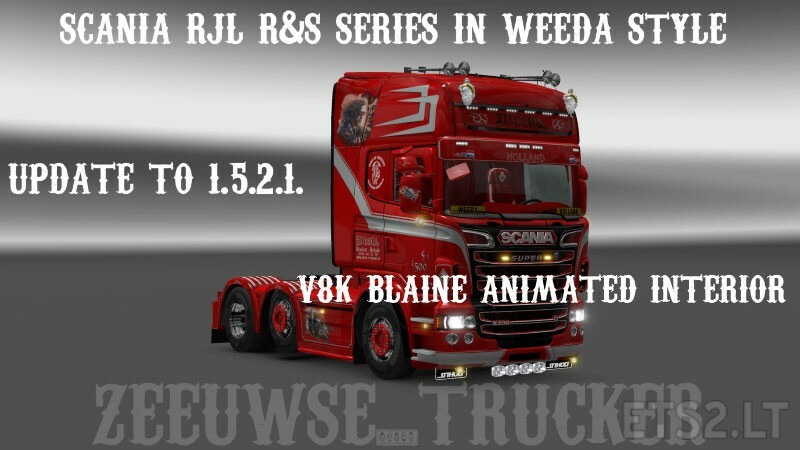 This is a update to RJL Scania R & S series version 1.5.2.1. ***YOU NEED RJL TRUCK MOD v1.5.2.1. TO WORK,*** give this mod a higher priority. Mod include: V8K animated interior adapted to weeda style for all cabin by me. Weeda paintjob pack for all cabin. player logo and weeda navigator cursor. all work well in version 1.24 all DLC. You can share this on other sites but KEEP ORIGINAL DOWNLOAD LINK AND CREDITS! NO NOT REUPLOAD TO OTHER FILE SHARING SITES! You’re the best dude thank you!! It is with V8 sound, or without? I only do interior and skin, you need rjl scania truck mod version 1.5.2.1. It works for me, but i will check tomorrow to be shore. I have tested the sound, it works for me, so it must be a mod conflict. I don’t like the sound anyway. I use this sound, Scania R730 V8 Stock Sound Mod (v2) by Bogdan Kasalap. fantastic sound mod. for the link, the site is out of order, i can’t get on de site “server error”. we just have to wait til it is fixt. Very nice,great job.you can transform interior into a beautiful blue?